Anywhere Else Across the Country and Make Some Serious Income! Part-time, Full-time, or Free Time! You can teach our Live Classes by becoming an Authorized Instructor. 1. Instructor Classes – An Online Video Series of 8 Main Training Classes that cover the steps to becoming an instructor, the business blueprint, making training interesting and fun, the operational and marketing systems, the business from soup to nuts, and the dollars and sense. Plus, we add new Video Classes to our Instructor Growth Track regularly so we are able to help you continue to grow yourself and your business by enhancing your skills, your performance, and your growth. And we give you videos to share with your customers and to use to expand the visibility and reach of your business. 2. Employee-Level Class – Online + Quizzes + Test. You can't teach what you don't know. We want you to be an expert. 3. Management-Level Class – Online + Quizzes + Test. You can't teach what you don't know. We want you to be an expert. 4. Ongoing Training via 2 times per month voluntary conference calls, new videos being added regularly and continual and ongoing training. 5. Tool Kit Access: packed with all kinds of goodies, logos, marketing materials, and more. And we will continue to add to this tool-kit as we roll-out new things. 6. Closed and Private Facebook Group for Instructors ONLY to share Best Practices, Ask Questions, Get Support and Learn New Things + access the tool-kit and other Instructors. 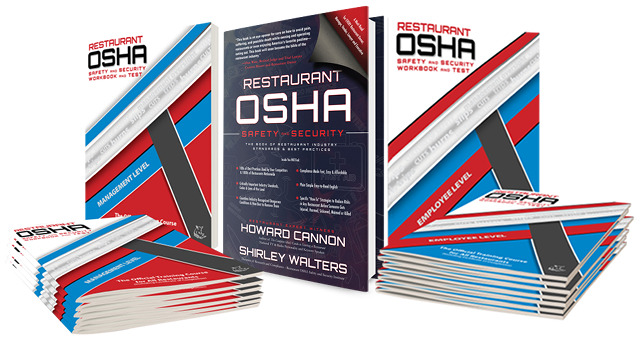 Once you are an Authorized Instructor you can teach Restaurant OSHA Safety and Security Live Classes anywhere you want. You can make significant and lasting income on a part-time, full-time, or free-time basis + turn your new-found visibility, credibility, and expertise into high-paying consulting gigs and better paying career opportunities if you like. We are book writers and course creators. And our CEO is a Forensic Restaurant Expert Witness for state and federal court cases and a well-known author. We wrote the books, text books, workbooks, and course curriculums. We will go the extra mile to teach you how to be a successful instructor and how to present our material using our unique and memorable formula for training that sticks with every student’s ribs – but you own your own business and can nearly everything your own way. You determine your own hours, your own rates, your own work schedule… basically everything. You simply use our content, workbooks, classes and tools to make money. Once we get you trained to be one of our Instructors – you can teach Restaurant OSHA Classes anywhere you want + in time, you will be able to cherry-pick other classes that you want to teach from our ever-expanding class menu. Then, all you have to do is attend that specific classes instructor training class and you will be authorized to teach that new class too. Then, you schedule, host, teach and profit from the classes you teach anywhere you want to teach them. And, you keep all the dough. That’s right. You get 100% of the dollars that your students pay you. We get none of it. You simply buy the workbooks for the classes from us. Please understand: not everyone can or should be an instructor. We prefer folks with restaurant experience, teaching experience & a passion for our industry. If you have questions give us a call. We would be happy to answer them for you as best we can. Howard Cannon is the world’s most sought after forensic restaurant expert witness and restaurant-industry consultant, with more than 175 testifying cases and several hundred pre-litigation consulting matters to his credit. He is called on by judges, juries, plaintiff and defense lawyers, members of the media, and industry executives to provide unbiased opinions pertaining to an astonishing variety of matters and incidents impacting the restaurant and bar industry across the United States and in markets around the globe. He has handled a plethora of underlying legal matters in which employees, customers, and vendors have been injured, harmed, sickened, maimed, or killed on the premises of restaurants; and, countless cases and projects of various sizes, types, and kinds pertaining to restaurant and bar operations, marketing, human resources, sales and profit performance, management oversight, purchasing, pilferage, and theft. Howard is the author of several books, including Restaurant OSHA Safety and Security: The Book of Restaurant Industry Standards & Best Practices© (2016),The Complete Idiot’s Guide to Starting Your Own Restaurant© (2001) and The Complete Idiot’s Guide to Starting Your Own Restaurant© (2005), published and distributed in bookstores in dozens of countries around the globe. He has appeared on national, regional, and local television and radio, and has been featured on The Dr. Oz Show, Live with Anderson Cooper, Hotel Impossible, Travel Channel, Inside Edition, CBS, and Fox, to name just a few. Cannon has given hundreds of workshops, seminars, speeches, and interviews, and has been published in countless magazines and newspapers.